The best things about holidays is all the extra time you get — perfect for planning lots of fun projects to do together! 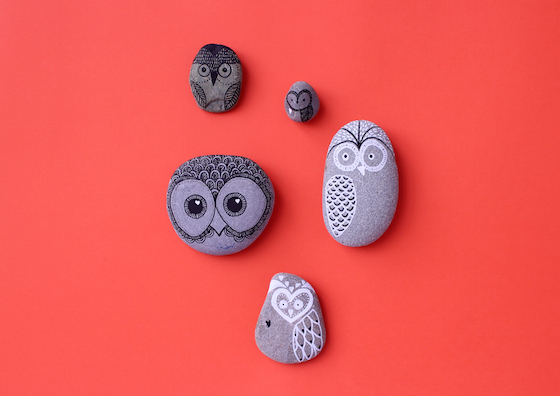 These gorgeous stone owls are so cute and they are great for getting everyone involved to make their own. Have fun together coming up with all your different characters. Once you&apos;ve created your characters, with a little help from Sugru you can mount them all on the wall at home using D-hooks (these are normally used for hanging pictures with screws, you can find them at your local hardware store). Step 2 — Start imagining all the little characters that can make — we used marker pens, but you can get crafty and use all sorts of different materials to create your design. Step 3 — Use Sugru to attach a D-Hook to the back of the stone and leave to cure. 24 hours later your awesome creations will be ready to take pride of place at home. They look great on the wall and are a lovely reminder of the fun you had creating them together. Sugru makes this project nice and easy because it&apos;s mouldable and fills weird gaps, so it doesn&apos;t matter what shape your stone is. It sticks to most materials including stone and forms a strong bond for as long as you want it. Plus Sugru is removable, so you can take it off again if you ever decide you want to.